"Bromberg" redirects here. For other uses, see Bromberg (disambiguation). Bydgoszcz (Polish: [ˈbɨdɡɔʂt͡ʂ] ( listen); German: Bromberg [ˈbʁɔmbɛɐ̯k]; Latin: Bydgostia) is a city in northern Poland, on the Brda and Vistula rivers. With a city population of 358,614 (June 2014), and an urban agglomeration with more than 470,000 inhabitants, Bydgoszcz is the eighth-largest city in Poland. It has been the seat of Bydgoszcz County and the co-capital, with Toruń, of the Kuyavian-Pomeranian Voivodeship since 1999. Prior to this, between 1947 and 1998, it was the capital of the Bydgoszcz Voivodeship, and before that, of the Pomeranian Voivodeship between 1945 and 1947. The city is part of the Bydgoszcz–Toruń metropolitan area, which totals over 850,000 inhabitants. Bydgoszcz is the seat of Casimir the Great University, University of Technology and Life Sciences and a conservatory, as well as the Medical College of Nicolaus Copernicus University in Toruń. It also hosts the Pomeranian Philharmonic concert hall, the Opera Nova opera house, and Bydgoszcz Airport. Due to its location between the Vistula and Oder rivers, and the water course of the Bydgoszcz Canal, the city forms part of a water system connected via the Noteć, Warta and Elbe with the Rhine and Rotterdam. Bydgoszcz, originally Bydgoszcza (feminine), is a pronoun name the second part of which – 'goszcz' comes from 'gost-jь' possibly or 'gost-ja' an old Slavic root which refers to an urban or suburban trading settlement. 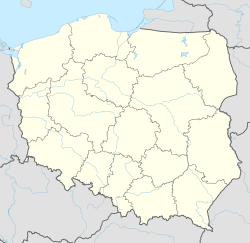 There are also a number of other Polish place-names which make use of the 'goszcz' suffix: i.e. Małogoszcz and Skorogoszcz. Bydgoszcz, however, has a long, rich history of etymological change: in 1239 known as Bidgosciam, in 1242 as castrum quod Budegosta vulgariter nuncupatur (castle, which is colloquially called Bydgoszcza), in 1279 as Bidgoscha, since 1558 as Bydgoszcz, that is, until the 16th century, and as Bydgoszcza "fishing village or campsite belonging to Bydgosta". The name 'Byd-gost' contains archaic elements of the Proto-Slavonic root 'byd' which existed as a variant of the verb 'to raise' (Ancient Russian 'vъzbydati' = stimulating, Proto-Slavonic 'bъděti' / 'bъd 'ǫ' = no sleep, to watch), and the common Slavic root 'Goszcz' (fireplace). Some people identify the name of the town as 'Budorgis', a name from the 2nd century which is listed as being next to the village Calisia on the amber route. The etymology of the German name of the town developed later and derives from the river Brahe (Brda in Polish), on whose banks the city is located, and berg, elevation, mount(ain), combined to 'Brahenberg', with 'a' pronounced in East Pomeranian Low German rather like 'å', later contracted to Bromberg, dropping the weak 'h', with the 'n' assimilated as 'm' to the following labial sound 'b'. During the early Slavic times a fishing settlement called Bydgozcya ("Bydgostia" in Latin), became a stronghold on the Vistula trade routes. In the 13th century it was the site of a castellany, mentioned in 1238. The city was occupied by the Teutonic Knights in 1331, and incorporated into the monastic state of Teutonic Prussia as Bromberg. The city was relinquished by the Knights in 1343 with their signing of the Treaty of Kalisz along with Dobrzyń and the remainder of Kuyavia. King Casimir III of Poland, granted Bydgoszcz city rights (charter) on 19 April 1346. The city increasingly saw an influx of Jews after that date. In 1555, however, due to pressure by the clergy, the Jews were expelled and came back only with the annexion to Prussia in 1772. In the 15th and 16th centuries Bydgoszcz was a significant site for wheat trading. During 1629, near the end of the Polish-Swedish War of 1626–29, the town was conquered by Swedish troops led by king Gustav II Adolph of Sweden personally. During the events of war the town suffered demolitions. The town was conquered a second and third time by Sweden in 1656 and 1657 during the Second Northern War. On the latter occasion the castle was destroyed completely and has since then remained a ruin. After the war only 94 houses were inhabited, 103 stood empty and 35 were burned down. Also the suburbs had been damaged considerably. The Treaty of Bromberg, agreed in 1657 by King John II Casimir Vasa of Poland and Elector Frederick William II of Brandenburg-Prussia, created a military alliance between Poland and Prussia while marking the withdrawal of Prussia from its alliance with Sweden. In 1772, in the First Partition of Poland, Bydgoszcz was acquired by the Kingdom of Prussia, renamed Bromberg, and incorporated into the Netze District in West Prussia. At the time, the town was seriously depressed and semi-derelict. Under Frederick the Great the town revived, notably with construction of a canal from Bromberg to Nakel (Nakło) which connected the north-flowing Vistula River via the Brda to the west-flowing Netze, which in turn flowed to the Oder via the Warta. In 1807, after the defeat of Prussia by Napoleon and the signing of the Treaty of Tilsit, Bromberg became part of his short-lived Duchy of Warsaw. With Napoleon's defeat at the Battle of Nations, the town was returned to Prussia in 1815 as part of the autonomous Grand Duchy of Posen (Poznań), becoming the capital of the Bromberg Region. In 1871 the Province of Posen, along with the rest of the Kingdom of Prussia, became part of the newly formed German Empire. In the mid-19th century, the arrival of the Prussian Eastern Railway (Preußische Ostbahn) contributed greatly to the development of Bromberg. The first stretch, from Schneidemühl (Piła) to Bromberg, was opened in July 1851. The city grew from 12,900 in 1852 to 57,700 in 1910 – of whom 84 percent were ethnic Germans and 16 percent ethnic Poles (Polish minority in Germany), all holding German citizenships. After World War I, despite Bromberg's German majority, it was assigned to the recreated Polish state by the 1919 Versailles Treaty. Now officially Bydgoszcz again, the city belonged to the Poznań Voivodeship. The local populace was required to acquire Polish citizenship or leave the country. This led to a drastic decline in ethnically German residents (German minority in Poland), whose number within the town decreased to 11,016 in 1926. In 1938, it was made part of the Polish Greater Pomerania. During World War II, Bydgoszcz was occupied by Nazi Germany and annexed to the Reichsgau Danzig-West Prussia as the seat of the district or county (kreis) of Bromberg. However, the unilateral annexation was only a matter of fact, but a legal naught not recognised in international law. On 3 September 1939, shortly after the war started, the Bloody Sunday incident occurred; while both ethnically German and ethnically Polish civilian Poles died during the fighting, Nazi propaganda used the deaths of ethnically German Poles and named the incident Bloody Sunday as a pretext for lethal reprisals against the ethnically Polish Poles following occupation of the city by German troops on 9 September. The history of Jews in Bydgoszcz ended with the catastrophe of World War II – the German invasion of Poland and the Holocaust. The city's Jewish citizens, many ethnically German, were sent to Nazi death camps or murdered in the town itself. Bromberg was the site of Bromberg-Ost, a women's subcamp of Stutthof concentration camp near Danzig (Gdańsk). A deportation camp was situated in Smukała village, now part of Bydgoszcz. An estimated 3,700 citizens of Bydgoszcz – Jews and non-Jews – died during the Nazi occupation. In 1945 Bydgoszcz was occupied by the advancing Red Army. The German occupation of the city had ended and the reestablished authorities of Poland took over, also forcibly expelling ethnically German Poles. In the same year it was made the seat of the Pomeranian Voivodship, the northern part of which was soon separated to form Gdańsk Voivodship. The remaining part of the Pomeranian Voivodship was renamed Bydgoszcz Voivodeship in 1950. In March 1981, Solidarity's activists were violently suppressed in Bydgoszcz. The oldest building in the city is the Church of St Martin and Nicolaus, commonly known as Fara Church. It is a three-aisle late Gothic church, erected between 1466 and 1502, which boasts a late-Gothic painting entitled Madonna with a Rose or the Holy Virgin of Beautiful Love from the 16th century. The colourful 20th-century polychrome is also worth noticing. The Church of the Assumption of the Holy Virgin, commonly referred to as "The Church of Poor Clares," is a famous landmark of the city. It is a small, Gothic-Renaissance (including Neo-Renaissance additions), single-aisle church built between 1582–1602. The interior is rather austere since the church has been stripped of most of its furnishings. Not a surprising fact, considering that in the 19th century the Prussian authorities dissolved the Order of St Clare and turned the church into a warehouse, among other uses. Nonetheless, the church is worth visiting and inspecting. In particular the original wooden polychrome ceiling dating from the 17th century draws the attention of every visitor. Wyspa Młyńska (Mill Island) is among the most spectacular and atmospheric places in Bydgoszcz. What makes it unique is the location in the very heart of the city centre, just a few steps from the old Market Square. It was the 'industrial' centre of Bydgoszcz in the Middle Ages and for several hundred years thereafter, and it was here that the famous royal mint operated in the 17th century. Most of the buildings which can still be seen on the island date from the 19th century, but the so-called Biały Spichlerz (the White Granary) recalls the end of the 18th century. However, it is the water, footbridges, historic red-brick tenement houses reflected in the rivers, and the greenery, including old chestnut trees, that create the unique atmosphere of the island. "Hotel pod Orłem" (Hotel Adler or The Eagle Hotel), an icon of the city's 19th-century architecture, was designed by the distinguished Bydgoszcz architect Józef Święcicki, the author of around sixty buildings in the city. Completed in 1896, it served as a hotel from the very beginning and was originally owned by Emil Bernhardt, a hotel manager educated in Switzerland. Its façade displays forms characteristic of the Neo-baroque style in architecture. Saint Vincent de Paul's Basilica, erected between 1925 and 1939, is the largest church in Bydgoszcz and one of the biggest in Poland. It can accommodate around 12,000 people. This monumental church, modelled after the Pantheon in Rome, was designed by the Polish architect Adam Ballenstaedt. The most characteristic element of the neo-classical temple is the reinforced concrete dome 40 metres in diameter. The three granaries in Grodzka Street, picturesquely located on the Brda River in the immediate vicinity of the old Market Square, are the official symbol of the city. Built at the turn of the 19th century, they were originally used to store grain and similar products, but now house exhibitions of the City's Leon Wyczółkowski District Museum. The city is mostly associated with water, sports, Art Nouveau buildings, waterfront, music, and urban greenery. It is worth noting that Bydgoszcz boasts the largest city park in Poland (830 ha). The city was also once famous for its industry. Unfortunately, some great monuments were destroyed, for example the church in the Old Market Square and the Municipal Theatre. Additionally, the Old Town lost a few characteristic tenement houses, including the western frontage of the Market Square. The city also lost its Gothic castle and defensive walls. In Bydgoszcz there is a great number of villas in the concept of garden suburbs. Buildings on the Brda River, with the 2004 tightrope sculpture. In the city there are 38 banks represented through a network of 116 branches (including the headquarters of the Postal Bank), whilst 37 insurance companies also have offices in the city. JP Morgan Chase, one of the largest financial institutions in the world, has established a branch in Bydgoszcz. Most industrial complexes are scattered throughout the city, however, the 'Zachem' chemical works deserves attention, covering tens of square kilometers in the south-east of the city, the remnants of the German explosives factory built in World War II occupy an area which has its own rail lines, internal communication, housing, and large forested area. Since 2000, Bydgoszcz has been annually subjected to international 'verification' ratings. In February 2008 the Agency 'Fitch Ratings', recategorised the city, increasing its rating from BBB-(stable forecast) to BBB (stable estimate). In 2004, Bydgoszcz launched an Industrial and Technology Park of 283 hectares, an attractive place for doing business as companies which relocate there receive tax breaks, 24-hour security, access to large plots of land and to the media, the railway line Chorzów Batory – Tczew (passenger, coal), the DK5 and DK10 national roads, and future freeways S10 and S5. Bydgoszcz airport is also close by. The city has, in recent years, become one of Poland's most important economic centres. This is especially true for the role the city plays in the economy of the Kuyavian-Pomeranian Voivodeship, of which it is, along with Toruń, capital. Muzeum Okręgowe im. Leona Wyczółkowskiego (Leon Wyczółkowski District Museum) is a municipally-owned museum. Apart from a large collection of Leon Wyczółkowski's works, it houses permanent as well as temporary exhibitions of art. It is based in several buildings, including the old granaries on the Brda River and Mill Island. In Bydgoszcz the Pomeranian Military Museum specializes in documenting the latest (19th- and 20th-century) Polish military history, particularly the history of the Pomeranian Military District and several other units present in the area. The city has many art galleries, two symphony orchestras and chamber and choirs. Bydgoszcz's cultural facilities also include libraries (including the Provincial and Municipal Public Library with an extensive collection of volumes from the 15th to the 19th centuries, and old books from Germany). Filharmonia Pomorska im. Ignacego Paderewskiego (Ignacy Paderewski's Concert Hall) – thanks to superbly designed acoustic qualities of the main concert hall, it is one of the best classical music concert halls in Europe. Concerts of popular music in Bydgoszcz are usually held in Filharmonia Pomorska, Łuczniczka, Zawisza and Polonia stadiums as well as open plains of Myslecinek's Rozopole on the outskirts of the city. Teatr Polski im Hieronima Konieczki (Hieronim Konieczka's Polish Theatre): Despite its name, the theatre offers a wide variety of shows both of national and foreign origin. It also regularly plays hosts to a large number of touring shows. Founded in 1949, since 2002 the theatre has taken part in the "Festiwal Prapremier" where the most renowned Polish theatres stage their latest premieres. There are also a number of private theatre companies operating in Bydgoszcz. In the years 1960–1986 there was an outdoor theater, the reactivation of which is currently being pursued by the Theatre Culture Association, "Fides" and the Acting School A. Grzymala-Siedlecki. The Pomeranian Philharmonic named after Ignacy Jan Paderewski has existed since 1953. The concert hall, which can hold 920 people is classified, in terms of sound, as one of the best in Europe, which is confirmed by well-known artists and critics (including J. Waldorff). Due to the phenomenon of acoustics, it attracts the interest of many famous artists. Bydgoszcz's stage has been frequented by many global celebrities, including Arthur Rubinstein, Benjamin Britten, Witold Malcuzynski, Luciano Pavarotti, Shlomo Mintz, Mischa Maisky, Kevin Kenner, Kurt Masur, Kazimierz Kord, Jerzy Maksymiuk and Antoni Wit. In recent years, the city has also hosted an excellent range of bands such as the BBC Radio Symphony Orchestra, the National Polish Radio Symphony Orchestra and others. The Opera Nova, in existence since 1956, started the construction of a new building in 1974 which was to consist of three main halls, situated on the Brda. The Opera Nova has become a cultural showcase of Bydgoszcz in the world. Considering the short history of the Opera, its success has been astounding; a large number of famous opera singers have performed there and theatrical troops from the Wrocław Opera, Theater of Leningrad, Moscow, Kiev, Minsk and Gulbenkian Foundation of Lisbon have also made appearances. The International Film Festival of the Art of Cinematography CAMERIMAGE is a festival dedicated to cinematography and its creators cinematographers. Bydgoszcz Music Academy - "Feliks Nowowiejski"
PKS Bydgoszcz – operates inter-city and international bus routes. Artego Bydgoszcz – women's basketball team playing in Ford Gemaz Extraleague. Astoria Bydgoszcz – men's basketball team playing in Dominet Bank Ekstraliga (formerly Era Basket Liga): 8th in 2003/2004 season, 6th in 2004/2005, 9th in 2005/2006. Now Astoria is playing in 2nd Polish League. Bydgoszcz Archers – American football team. Pałac Bydgoszcz – women's volleyball team playing in Polish Seria A Women's Volleyball League: 2nd place in 2004/2005 season, 4th place in 2005/2006 season. Polonia Bydgoszcz – speedway team. The club has won Polish Speedway League 7 times (lately in 2002) and European Team Championship 3 times (lately in 2001). Zawisza Bydgoszcz – football team. RTW Bydgostia Bydgoszcz – Rowing (sport) Bydgostia Regional Rowing Association was founded on 4 December 1928. The Club was A Team Polish Champion in the following years: 1938, 1966, 1967, 1970 and for the successive seventeen years from 1993 to 2009. KKP Bydgoszcz – women's football Team. Bydgoszcz was the host of the IAAF World Junior Championships in Athleticsin 2008 and 2016, 2008 and the European Athletics U23 Championships in 2003 and 2017. Bydgoszcz hosted the IAAF World Cross Country Championships in 2013 and 2010. It is also said that Pan Twardowski spent some time in the city of Bydgoszcz, where, in his memory, a figure was recently mounted in a window of a tenement, overseeing the Old Town. At 1:13 p.m. and 9:13 p.m. the window opens and Pan Twardowski appears, to the accompaniment of weird music and devilish laughter. He takes a bow, waves his hand, and then disappears. This little show gathers crowds of amused spectators. Wikimedia Commons has media related to Bydgoszcz. Wikivoyage has a travel guide for Bydgoszcz. Wikisource has the text of the 1911 Encyclopædia Britannica article Bromberg. Bromberg-Ost, a female subcamp of the German concentration camp Stutthof, located in Bydgoszcz. Bydgoszcz Department (Polish: Departament Bydgoski), a unit of administrative division and local government in the Duchy of Warsaw from 1806–1815. ^ Team, 3W Design. "Camerimage - International Film Festival". www.camerimage.pl. Archived from the original on 2017-08-03. Retrieved 16 May 2017. ^ "Granaries on the Brda - Bydgoszcz, Official Tourism Website, visitbydgoszcz.pl". www.visitbydgoszcz.pl. Retrieved 16 May 2017. ^ Heinrich Gottfried Philipp Gengler: Regesten und Urkunden zur Verfassungs- und Rechtsgeschichte der deutschen Städte im Mittelalter. Volume I, Enke, Erlangen 1863, pp. 403-404 and pp. 976-977. ^ Ludwig Kühnast: Historische Nachrichten über die Stadt Bromberg – Von der Gründung der Stadt bis zur preußischen Besitznahme. Bromberg Berlin Posen 1837, pp 64-68. ^ Ludwig Kühnast (1837), pp. 112-117. ^ a b c August Eduard Preuß: Preußische Landes- und Volkskunde. Königsberg 1835, p. 381. ^ Baedeker, Karl, Northern Germany, London, 1904, p.163. ^ "Encyklopedia PWN". Encyklopedia.pwn.pl. Archived from the original on March 24, 2005. Retrieved 2009-05-05. ^ a b c Historia Bydgoszczy (ed. by M.Biskup). PWN. 1991. pp. 156–164. ISBN 83-01-06667-9. ^ a b Johann Friedrich Goldbeck: Vollständige Topographie des Königreichs Preußen. Teil II, Marienwerder 1789, p. 82-83. ^ a b August Karl von Holsche: Der Netzedistrikt, ein Beytrag zur Länder- und Völkerkunde mit statistischen Nachrichten. Königsberg 1793, p. 111. ^ a b c d e f Michael Rademacher: Deutsche Verwaltungsgeschichte Provinz Posen - Stadtkreis Bromberg Archived 2015-06-02 at the Wayback Machine (2006). ^ Meyers Konversations-Lexikon. 6. Auflage, Band 3, Leipzig und Wien 1906, p. 448. ^ Der Große Brockhaus. 15. Auflage, Band 3, Leipzig 1929, p. 366. ^ "PESA Bydgoszcz SA". Pesa.pl. Retrieved 2011-09-16. ^ "Kragujevac Twin Cities". ©2009 Information service of Kragujevac City. Retrieved 2009-02-21. ^ "Διεθνείς Σχέσεις". e-patras.gr. Archived from the original on 2012-07-30. Retrieved 2011-09-16. ^ "Twinning Agreement". Bydgoszcz City Hall. Archived from the original on 9 March 2012. Retrieved 24 January 2017. ^ "Pitesti (Rumania)" (in Polish). Oficjalny Serwis Bydgoszczy. 6 October 2016. Retrieved 24 January 2017. Ludwig Kühnast: Historische Nachrichten über die Stadt Bromberg – Von der Gründung der Stadt bis zur preußischen Besitznahme (Historical news about the town of Bromberg – From the town's founding to the Prussian occupation). Bromberg Berlin Posen 1837 (Online) (in German).